We invite local vendors, suppliers, and contractors to learn about purchasing and contracting opportunities for the Broadway Corridor project. Please submit your organization’s profile for consideration as opportunities may be made available by Prosper Portland and/or our project partners. The redevelopment of the Broadway Corridor is viewed as a once-in-a-generation project that will transform a large section of the central city and result in an array of contracting opportunities for local companies. We are very early in the planning phase. Opportunities will be very limited until a Development Plan for the site is completed in summer 2019. Your profile will be added to a "contractor pool" for this project and will be shared with project partners including development partners. There is no guarantee you will be contacted or selected for an opportunity. Please check each type of opportunity that applies. Note that there is no guarantee that opportunities are available for each service type below. Thank you for your interest in the Broadway Corridor project! We have received your information. Your information will be populated into a contractor pool for this project. Prosper Portland makes no guarantee of any work. Please be aware that with the long-term nature of this project, opportunities will be available at various times. Equity Policy – Prosper Portland promotes diversity in all aspects of purchasing and contracting. Sustainable Community - Prosper Portland is committed to retaining and building sustainable communities with local resources, suppliers, and workforce. Community Commitment - Prosper Portland is committed to providing contracting and purchasing opportunities to our communities with a strong emphasis on encouraging partnerships with minority, women-owned and emerging small businesses. Prosper Portland is leading a Development Plan for the 34-acre Broadway Corridor site. The Development Plan will include land use planning and design, financial analysis, identification of public benefits to be included in a community benefits agreement, and public outreach for the redevelopment of the site. The process for putting together the Plan is expected to be completed by summer 2019. The Broadway Corridor Steering Committee and Continuum Partners serve as advisers to Prosper Portland for the Development Plan. 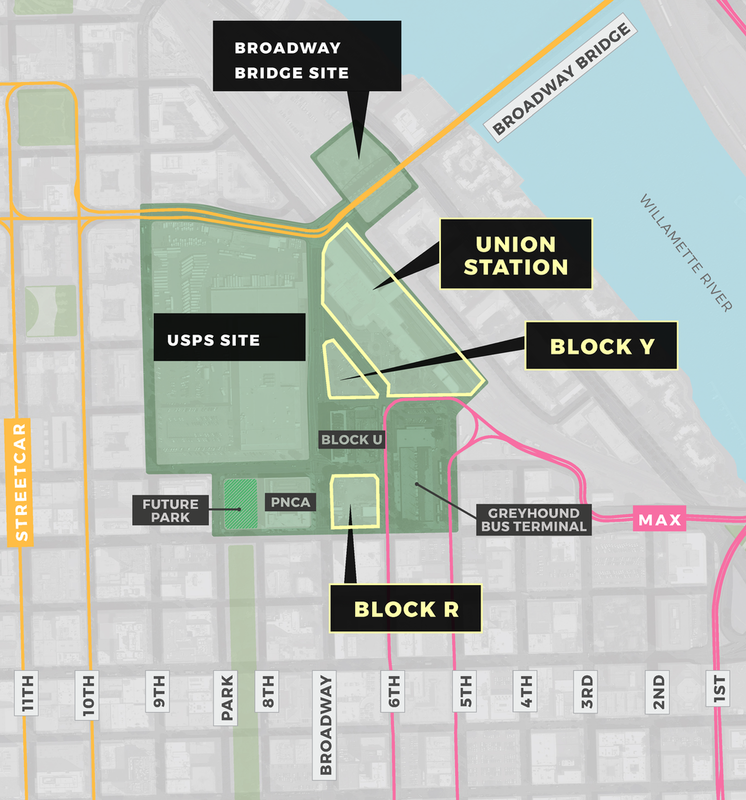 Continuum Partners has the opportunity to continue in the implementation phase of the project with exclusive negotiation rights to redevelop Prosper Portland’s share of the 14-acre USPS property within the Broadway Corridor site. Portland Housing Bureau controls the remaining share of the USPS property and will seek additional development partners at their discretion. Prosper Portland will seek developers for the remaining Prosper Portland-owned parcels in the Broadway Corridor site: Union Station, Block Y, and Block R (see yellow-outlined properties in above map).